Figure 1. 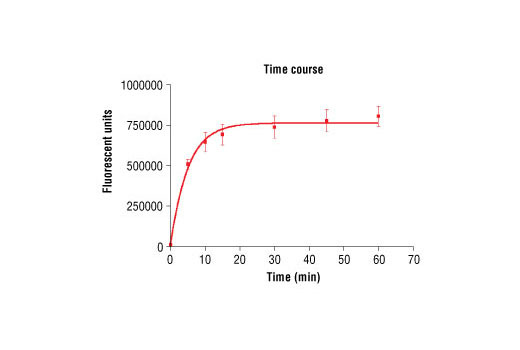 PRK1 kinase activity was measured in a radiometric assay using the following reaction conditions: 60 mM HEPES-NaOH, pH 7.5, 3 mM MgCl2, 3 mM MnCl2, 3 µM Na-orthovanadate, 1.2 mM DTT, ATP, variable, 2.5 µg/50 µl PEG20,000, Substrate: Histone H2B, 1.5 µg/50 µl and Recombinant PRK1: 200 ng/50 µl. 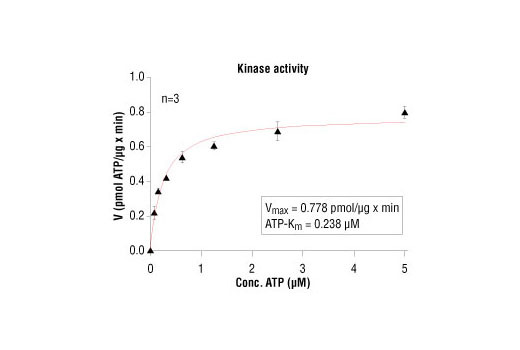 The kit provides a means of performing kinase activity assays with recombinant human PRK1 kinase. 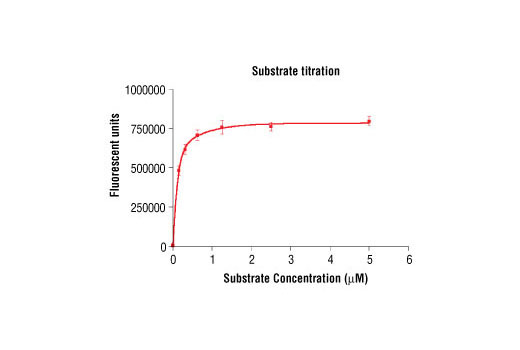 It includes active PRK1 kinase (supplied as a GST fusion protein), a biotinylated peptide substrate and a phospho-serine/threonine antibody for detection of the phosphorylated form of the substrate peptide. Peptide substrate, Biotin-CREB (Ser133): 2,326 Daltons. 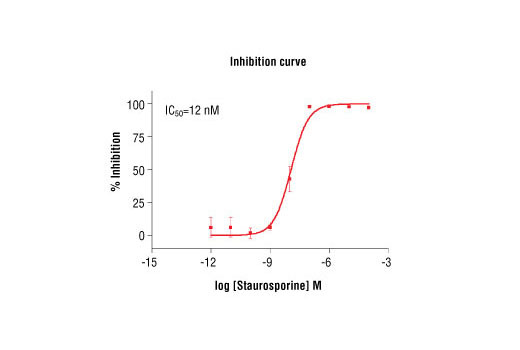 GST-PRK1 Kinase: 137 kDa. 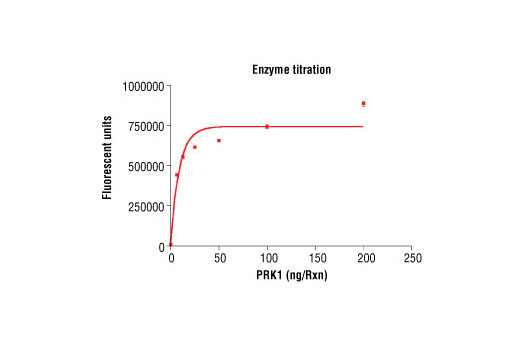 The protein kinase C-related kinases (PRKs) are a subfamily of Ser/Thr-specific kinases with a catalytic domain highly homologous to the PKC family (1-3). They are effectors of Rho family GTPases (4-6) and are activated by fatty acids and phospholipids in vitro (7,8). Activation in vitro and in vivo involves the activation loop phosphorylation of PRK1 (Thr774)/PRK2 (Thr816) by PDK1 (9,10). Mukai, H. et al. (1994) Biochem. Biophys. Res. Commun. 199, 897-904. Morrice, N.A. et al. (1994) J. Biol. Chem. 269, 20040-20046. Palmer, R.H. et al. (1994) FEBS Lett. 356, 5-8. Watanabe, G. et al. (1996) Science 271, 645-648. Amano, M. et al. (1996) Science 271, 648-650. Vincent, S. and Settleman, J. (1997) Mol. Cell. Biol. 17, 2247-2256. Morrice, N.A. et al. (1994) FEBS Lett. 351, 171-175. Palmer, R.H. et al. (1995) J. Biol. Chem. 270, 22412-22416. Dong, L.Q. et al. (2000) Proc. Natl. Acad. Sci. USA 97, 5089-94.